Number 9 on the Toronto Star’s Bogey Man’s Top 18 courses in 2002 and a Top 9 Water Hazard hole in 2001, the LochNess Links Golf Club provides the Niagara Region with one of the best courses in the region. Formerly known as Hunters Pointe Golf Course, this golf course has been designed to model some of the fantastic courses in the Scottish Highlands. Located on a 225 acre land previously owned by the St. Lawrence Seaway Authority, LochNess Links Golf Course was designed and modeled by Graham Cooke & Associates to look and feel like the great Scottish Highlands where the game of golf originated. 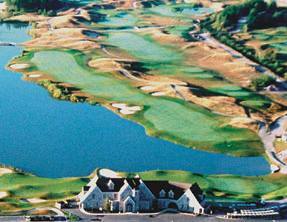 The course was built in 2000 and is home to seven ponds, 110 pot bunkers, rolling fairways and contoured greens. LochNess Links is a challenge for anyone, with hard to handle roughs and deep bunkers, all golfers need to attempt to stay on the fairway at all costs. With long Par 3 holes and tough obstacles to handle, LochNess Links also offers wonderful scenery and a wonderful setting along the St. Lawrence Seaway.